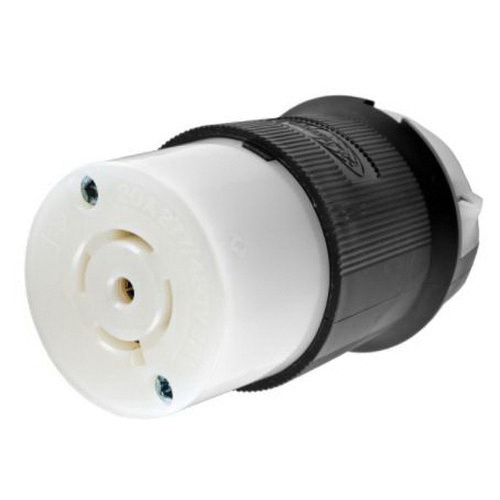 Hubbell-Wiring Twist-Lock® 4-Pole 4-Wire Insulgrip Twist-Lock connector in black and white color, is current rated at 20-Amps and voltage rated at 277/480-Volt AC. This 3-Phase Y connector with pressure screw terminal connection, accepts conductors of size 16 - 8-AWG and cords of size 0.35 - 1.15-Inch. This connector features nylon construction with brass contact. It has a dimension of 2.33-Inch Dia x 3.86-Inch. Connector withstands 2000-Volts minimum dielectric strength. It has NEMA L22-20R configuration. It withstands temperature range of -40 to 75 deg C. Connector is UL listed, CSA certified and meets Federal W-C-596 specification.